Only 84 calories each with 9 grams of protein!! Tastes like real cheesecake without all the crap - the filling uses only 4 ingredients: Greek yogurt, protein powder, cottage cheese and an egg white! 2. In a food processor or NutriBullet, mill 3 tbsp pecan halves with 1/2 tbsp coconut flour. Mix in vanilla extract and 2 tsp almond milk. Divide into 6 silicone baking cups and press into bottom to form crust. Set aside. 3. In a food processor or Nutribullet, blend 1/3 cup cottage cheese and egg white until smooth. Mix in 2/3 cup Greek yogurt, 1 scoop Cellucor Whipped Vanilla and 2 packets of Truvia until smooth. Pour evenly into baking cups, leaving about 1/4 inch space at the top of the cups. 4. 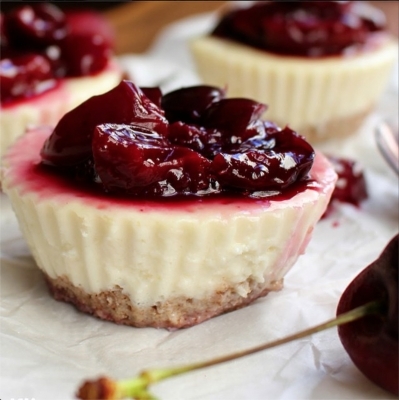 Place cheesecake cups into larger baking dish and fill dish with water until almost even with the top of the cheesecake filling. Bake at 325 degrees for 20-23 minutes or until centers of cheesecake are still a little jiggly (like Jello). 5. Allow cheesecakes to cool in the water bath until water is room temperature, then remove cheesecakes from water bath and refrigerate, uncovered for at least an hour before serving. 6. In a small saucepan, bring cherries, 1/2 tbsp water and 1 packet Truvia to a boil over medium-high heat. Lower heat and continue to simmer for 15-20 minutes, or until the cherries are tender and the liquid has thickened. Allow to cool and add on top of cheesecakes before serving.